Evangelist Ellen Marie Allen was born Ellen Marie (Groves) and raised in Grand Rapids, Michigan. She was only girl child born to the union of Glendora Lathan and Pauline Groves. She was introduced to the Lord through her mother at an early age where they attended the Good Shepherd Church under the pastorate of the late Reverend Robert Lowe. A verbal agreement was devised between her mother and aunt that if anything was to happen to her mother, her aunt would see to it that Ellen was cared for. In 1961, at the tender age of six, Ellen�s mother went to be with the Lord and her Aunt Mrs. Margaret Lucille Holmes (father�s sister) known to Ellen as (Tee) then raised her along with the continued love and support of her father. In 1969 at the age of 15, she recommitted herself to the Lord under the leadership of Elder Ben Matthews at the Revival Center C.O.G.I.C. where she received the baptism of the Holy Ghost. A few years later, she moved to complete her education and received her diploma from Monroe High School in Monroe, Michigan. In 1972, Ellen began a career in the Banking Field and remained with the same employer in many capacities for 23 years. At the age of 16, she met and fell in love with Minister Rance Lee Allen of Monroe Michigan. With her father�s consent, they were married on December 1, 1970. In 1985, the then Apostle Gilbert Earl Patterson, bought a facility in Toledo, Ohio and placed Elder Rance Allen and his wife Ellen to lead the flock. In 1995, to assist her husband in the ministry she retired from the field of banking. As of this year, she has been a first lady for 30 years. 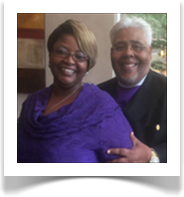 In 2011, her husband was elevated to the Bishopric within the Church of God in Christ; she became the bishop's wife to the Bishop Rance L. Allen and the First Lady of The Michigan Northwestern Harvest Ecclesiastical Jurisdiction. To this union no natural children have been born, but they have both many spiritual children and have welcomed approximately 35 God children. Ellen, a gifted teacher and lover of the word has held many offices in the ministry since 1969, from church secretary to choir member, president of the youth dept, choir treasurer, youth program coordinator, Prayer & Bible Band (president and teacher), Young Women�s Christian Council (YWCC) president, and teacher and she is presently YWCC teacher, assistant teacher for the Pastor�s Bible Study, and the annual Women�s Day Coordinator. In addition to the current offices Ellen holds, God had a greater call on her life. She recognized and accepted the call to further teach and expound the word of God. In addition to being an anointed teacher, in July of 2000 she was licensed as a Deaconess Missionary in the Ohio North First Jurisdiction, under the leadership of Interim Bishop P.A Brooks and State Supervisor Mother Sarah Alice Thompson. Mother Thompson was so impressed with Sister Allen�s ministry knowledge and ability to expound the scriptures that she presented her with her evangelist license in July of 2001, under the leadership of the late Presiding Bishop of the Ohio North First Jurisdiction, Bishop Walter E. Jordan. 1. Completing and receiving her High School Diploma (which people said she would never do. 3. Last but not least the most precious accomplishment is her 44 years of marriage to the sweetest, most humble, patient, loving, giving man this side of glory, Bishop Rance Lee Allen. Sister Allen has many favorite scriptures. One that is a constant reminder; �If God be for you; who can be against you�, which is also words of a song she often sings. She often says �Don�t ask me anything if you don�t want to know the truth�. But of course any one that knows her knows that you will get the truth whether you want it or not. We thank God for Sister Allen for she is the epitome of a working, anointed, strong, and gifted First Lady and Bishop's wife. For whatever her hands find to do, it will be done as close to perfection as possible.